This is an interesting thing that I noticed. When we were in YCombinator, there were a lot of speakers that came in who talked about how detrimental adding VCs to your board could be. I think it was Mark Pincus, actually, who came in and was talking about how detrimental VC influence in some of his other companies were. The whole argument was: VCs come in. They want you to go big or go home. Hit a home run. They're going to force you to make decisions that are really risky, and that might not be best for the company. He had some bad experiences and, in his mind, that had ruined a few of his companies. He was really adamant in saying: Don't let any investors be hands on; the best thing you can get are hands off investors. We heard that from a few different people. After having reflected on it, I think it can be true for later stage companies with more seasoned founders. Definitely when you're getting to a Series C stage and a VC pushes you to make risky decisions, I can see how that might be a problem. But for early stage companies I think you need as much investor help as possible, especially when you're a first time founder. We knew nothing. We knew absolutely nothing. Instead of going out and benefiting from this great YC network, we tried to get investors that were going to be as hands off as possible. We actually turned down a few investors because they wanted to be more hands on. One of the biggest mistakes we made. And there really was this sort of view in the Valley that the better company you were, the more desirable of an investment you were, the more control you could have over saying: We don't want you to have a board seat; we don't want you to be hands on. So we almost wore it as a badge that we don't have hands on investors, we don't talk to our investors. They just gave us money and they trusted us. I think that sort of thinking is backward and really detrimental. I hope it's changed or is changing, but I've heard both sides of the story from friends that are out there. Update: Here are YCombinator's updated guidelines for fundraising. 1) You should care more about good investors than good valuations. Use the YC investor database, talk to us, talk to alumni, and talk to the founders of the companies that investor has funded (especially in cases when the companies haven't worked out). However, you should insist on clean terms (in practice, offering messy terms is a sign of being a bad investor). 2) You should aim to sell only about 20% of the company in your seed round (though 25% is ok if you're raising a 'large'--say more than $2.5 million--seed round). 3) You should raise enough money to get to your next significant milestone. 4) You should try to get the process over with reasonably quickly so you can get back to work. The founders that fall in love with fundraising rarely go on to be the most successful. For my first post, I thought I'd share a bit about how I came to join Genacast and a few thoughts on why I believe we have the best vehicle for capitalizing budding technology startups. I've spent most of my working life thus far as an "operator" at Google. I helped launch several widely used products and services, primarily within Maps. In that capacity, I worked closely with our developers and helped bring together resources to make these launches possible. I built a team from zero to a few dozen employees and earned the trust of brilliant engineers along the way. One of the valuable lessons I learned at Google was that anyone building new technologies should optimize for success by aligning themselves with sponsors and advisors who (a) understand technology and (b) have been in the trenches themselves. When the itch for something new came around, I had no idea where to look at first. Having spent so much time deep in the weeds on a product with few competitors, it wasn't clear where I should apply my skills. After discussing this issue with some friends that had recently launched their own tech startups, I was surprised to learn that my timing coincided with a frenzy of venture capital investment into the transportation and fulfillment space. It turned out that the knowledge I had built up was very relevant, and so began my career in venture capital, initially helping firms develop a perspective on these areas and later expanding to cover a broader range of sectors. When the chance to join Genacast presented itself, I jumped at the opportunity. Not only do Gil's credentials as a technologist and entrepreneur make an apprenticeship with him a no-brainer, Genacast also has a truly remarkable track record of helping entrepreneurs succeed. While Gil will tell you that he's been very lucky, it's clear to anyone watching that it hasn't been by accident. I could try to explain the success by expounding on our value-add services as many VCs do (and perhaps I will in a future post), but I believe it boils down to the same lesson I learned at Google: entrepreneurs benefit most when they partner with kindred spirits – investors who have experience in the field, as well as a true passion for the technology being built. At Genacast, we are founders and operators with a passion for technology. And we’re in rare company – a recent survey conducted by TechCrunch showed that <2% of VC firms were made up of investors with both engineering degrees and operating experience. Having seen operations first-hand across several VCs, there's an obvious difference in the quality of answers and the level of support offered by a partner that has walked in your shoes and one that has not. In addition to being a valuable asset in product/go-to-market brainstorming and a contributor of relevant resources, this type of partner is also aligned with the entrepreneur every step of the way and understands their perspective because they have been there themselves. I believe this is a meaningful advantage for our firm and one that is deeply rooted in our DNA. I'm proud to be a part of the Genacast team and look forward to continuing our support of entrepreneurs solving big problems. Google acquires Genacast Portfolio Company Divide (aka Enterproid) Today Divide (aka Enterproid) was acquired by Google. 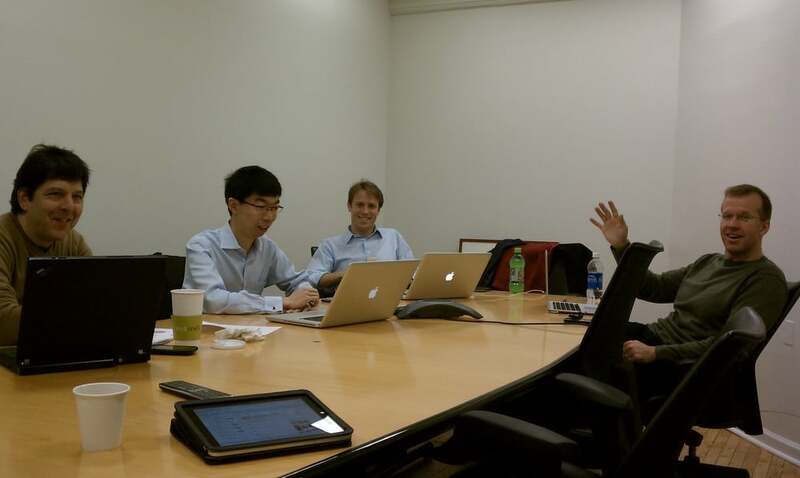 This is a wonderful story about an amazing founding team -- Andrew Toy, David Zhu and Alex Trewby -- who had a vision that employees would "bring your own (mobile) device" (BYOD) into the workplace and that security would be paramount. Their solution was revolutionary, giving your phone dual persona: work and personal. Years ahead of its time back in 2010 when we led their seed round and still cutting edge today. If there is a lesson here it would be think big, be laser focused on execution and surround yourself with people who complement and challenge you. Divide was a family with amazing talent spread all over the globe in New York, London and Hong Kong. A truly international effort. I am grateful to Owen Davis of NYC Seed for introducing me to this opportunity and being a great partner over these 3.5 years. Google is acquiring ground-breaking technology and a wonderful team. I look forward to seeing more amazing developments from the Divide, now Google team. A heartfelt congratulations to the entire Divide team for a job well done and well deserved. Thank you for allowing me to take this journey with you. I am certainly a better person for it with many new friends. After managing teams in early stage companies for 15+ years, I have found making good hiring decisions goes beyond ensuring the team has needed skills and ability to scale. The introduction of individuals to a team, especially a small team, can be incredibly beneficial or detrimental. Beyond skills and team fit, I look for two abilities, which are important to both individual and team success in an early stage company. The candidate can create something from nothing. Not everyone can stand in front of a blank whiteboard and make a start at bringing a concept to reality. The best candidates will feel comfortable starting with nothing and be able to draft an initial design, purchase and deploy a first server or conceive a nascent business process and understand that they will iterate. The candidate expects things to go wrong. An early stage company's day to day is filled with surprises. The best candidates will NOT have the expectation that their days will go as planned, but instead will be expecting the unexpected and be able to respond. Here are some of the questions that I use to identify these abilities in a candidate. What do you love about your current job? I want to hear something like "I was given the opportunity to come up with how to do [blank]. It was really fun" or "I never know what to expect when I get to the office". Red flags would include "The system that I maintain is really important to the company" or "I am able to get through my to do list which I find very satisfying" or "My manager gives me very clear direction, I always knew what is expected." If hired, how do you think you would spend the first two weeks? I want to hear something like "I would spend time with the team to understand what is in place, what is not and what is needed right away." Red flags would include "I would read the company documentation and participate in company orientation" or "I would work closely with my manager to understand my responsibilities." In what kind of environment do you feel most effective? I want to hear something like "I work well in an open, collaborative environment" or "Give me a project and I will figure out how to get it done." Red flags would include "I like to know what is expected so I can plan"
Describe a difficult challenge that you faced. Regardless of the candidate's challenge, I want to understand how they responded to the unexpected, how they managed their frustration and if they were able to overcome. If not, what did they learn? Ideally, if you can hire through your network, do. Your network can give you additional perspective on the candidate’s abilities. If you are hiring new college grads, participate in internship programs. I have had good success with students that have interned, demonstrated their abilities and self-selected into the team. Finally, in the interview, be clear about the challenges of working in an early stage company. Foosball and free snacks aside, dealing with lack of process, continuous evolution, time constraints and strong personalities is hard. It is not for everyone. But with the abilities to create something from nothing and to expect things to go wrong, candidates will be more effective and comfortable with an early stage company’s challenges.